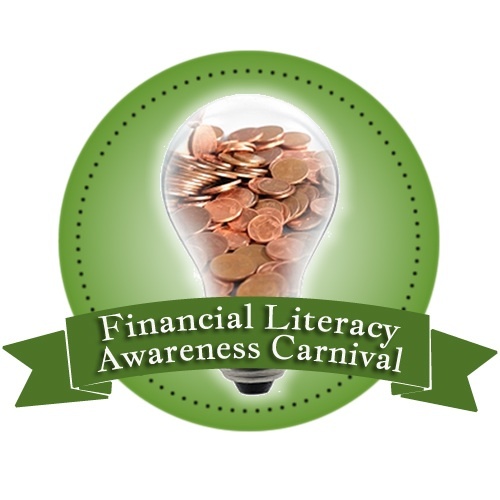 It’s Financial Literacy Month and I’m pleased to be part of an awesome blog carnival today hosted by Shannon from The Heavy Purse. In case you are unaware, Shannon’s passion is all about helping parents raise financially confident and responsible children. Her perspectives on that issue are some of the best I’ve read. I highly encourage you to check out her site, especially today and see what all the other carnival participants are writing about. That’s right…my financial life really did change one while shopping for shoes. I’ve shared the details of my story here before, how I chronically spent more each month than my wife and I brought in. I was driving my wife crazy as our budget never worked and we continually took money out of savings each month to cover my undisciplined spending. Through a series of events – which included being exposed to Dave Ramsey’s teachings and some personal conviction and soul-searching on my part – I began to turn the corner. We cut up our credit cards, developed some oneness in relation to our finances and goals and attacked our budget with abandon. Our first step was to go to an all-cash and debit card system for transactions. Credit cards hadn’t worked for me so we decided to give this new system a try. I was very nervous about this, having never really believed in paying in cash for anything. One area we specifically chose to target for cash payments was our clothes budget. We each received a set amount in an envelope each month and were free to use that on our clothing needs. No problem right? Shoe Sale: Buy One, Get One Half Off! Now this may seem strange for a man, but I love shoes. I really could fill up a closet full of them if I let myself. Sneakers, running shoes, casual, dressy, hiking boots…you name it, I’m there. So that sale sign was just like saying “Sic ‘em” to a dog. Foaming at the mouth, I immediately found a pairs of Dockers then another pair of shoes that I loved. Then I looked at the price tags. “Oh, this would be an incredible deal” I thought. Can’t pass this up. Only problem was I didn’t have enough money in cash to purchase the jeans and two pairs of shoes. The added cost of the half-off pair of shoes would have put me over budget by $25. But it was such a great deal! I was stuck. The first thought that ran through my head was, “I’ll just use my debit card…it’s only $25.” No big deal. I tried to scenario plan on how I could justify the purchase to my wife. Based on how I had manipulated conversations in the past, I could surely convince her my breach of etiquette was no big deal. She wouldn’t really care anyway, right? Talk about a buzzkill. I was ready to have a smackdown with my conscious right in the middle of the store. Instead I paused, and thought, and breathed. For five minutes, I waged this battle in my mind. Finally, as if I were having withdrawal symptoms, my shaky hands put the half-off pair of shoes back on the shelf. I walked to the register, purposefully not looking back at the shoe department for fear I would change my mind. *A little decision, simply drawing a line in the sand somewhere, can have a huge impact. *My choices reflect how seriously I’m committed or not. *Marketers really understand what triggers our emotions and spending patterns. *“It’s only” excuses block us from real change. *Commitments, especially to those you love, should not be taken lightly. Questions: What would you have done in my situation? What has been your biggest money “A-ha” moment? Anyone else like shopping for shoes? Oh my gosh, Brian – I’ve had more moments like that than I can count, and you’re right about the feeling of saying “No” – it really does mimic withdrawal symptoms. How scary is that? Luckily, I’ve tamed that lion, and happy for you that you have too. Thanks for sharing an awesome story. It’s pretty scary. Just goes to show you how powerfully emotional spending can be. Very impressive! Putting that second pair of shoes back is very difficult. I have the same problem when I find a fantastic deal online. It all comes down to if I really need the item and if it fits my budget. Its’ a struggle sometimes, but I’m always happy when I go through the process! “…if I really need the item and if it fits my budget.” That really is the determining factor in whether or not to make the decision to buy. “…it is only $25!” That’s what I kept screaming to myself inside my head. I mean really it’s not that much at all. And those shoes probably would have lasted at least a year. Great deal! I can completely relate, Brian. I love shoes too and a 2 for 1 sale was a great reason to get 4 pairs of shoes. 🙂 I’ll be honest; I have struggled in the past with keeping my commitments to my goals. It always confused me because I took work goals very, very seriously. But my own personal goals, meh. It took a long time for me to realize that I was setting goals that I really didn’t care about so it made it way too easy for me to justifying buying whatever I wanted. It’s still a work in progress for me but when I find myself being wishy washy with my goals it’s a red flag that I need to do some soul-searching as to why I am waffling. I’m really glad you mentioned that Tanya and I don’t think it’s all that uncommon. We can struggle in one area at the same time we are absolutely killing it in another. I agree that one trick is to set goals you care about. There is more likelihood to follow through that way. “…won’t eat lunch…” Don’t think I could do that. I love eating too much. That’s why I have to run. 🙂 Thanks for commenting! I have to say that I think you have the best title out of everyone – not that it’s a competition. Or maybe, like you, I’m just drawn to shoes. 🙂 I love your story, Brian. It’s one so many of us struggle with. We decide to do something differently but at the first obstacle, we cave and revert back to old habits, even if that good angel is screaming “no” in our ears. I love all the lessons you learned but this one resonants so strongly with me, “*A little decision, simply drawing a line in the sand somewhere, can have a huge impact.” It really does make a difference and can help us break old habits. Thanks for sharing your money a-ha today. I appreciate your support and participations! I work really hard on those titles…sometimes too hard. 🙂 It’s been great reading what all the other writers have shared. If there has been one common theme from all the posts it’s been that of hope. No matter how bad a person has it, the tide can always be turned. And yes, as I read on some other posts, it simply takes a simple step to begin the change. I draw a lot of inspiration from my faith and those close to me. My wife and kids are looking for me to lead and I try my best to follow through with commitments. Sometimes I fail of course, but my goal is to honor what I agreed to do. Thanks for commenting! My boyfriend is also obsessed with shoes. It’s funny cause I’m totally NOT. In fact, I can’t remember the last time I bought any kind of clothing. I get so many hand me downs from people clearing out their closets that I almost never need to shop! There’s something about those items that we wear at the edges of our body that really attract my attention. Shoes, watches, hats, sunglasses…I can’t figure it out. ha ha we both have that angel/devil sitting on our shoulders! It’s funny how just one day everything seems to click…even if there are a few slip ups after that. But it really is like an a-ha moment. I never had the “shoe” thing. Mine practically have to be falling off my feet before I buy a new pair. “…angel/devil…” It’s a daily battle and in more areas than simply finances. I would like to think I’d put the shoes back, but I’d probably talk to my wife and try to get her to agree to my purchase. I know that’s sad, but I think that’s how it would go down. I really like this point you made: “A little decision, simply drawing a line in the sand somewhere, can have a huge impact.” This is such an important point that can’t be stressed enough. It’s the small choices that matter the most sometimes. I ran through all the scenarios in my head of how I could pull off this purchase. In the end, I had to agree to the system we decided on. In addition to not helping me change, I felt to to do anything else would have violated the agreement I had with my wife. Thanks Mackenzie. I think people downplay how much emotions can control spending, on both sides of the equation. Getting down and depressed can drive it as well as getting overly excited. B1G1 sales have their place and I use them often. Just don’t extend myself anymore beyond what I have budgeted. Curious…what running shoes do you prefer? I run a lot and am always interested in what people wear. I have totally had those … “It’s only …” moments. I think you said it best in that you need to draw the line. And I think it is wonderful you and your wife established a system. It is so important for spouses to get on the same page. My husband and I also needed to do that early in our marriage. I tend to be more of the saver and financial geek, and he is more of the spender – but we are definitely a team now. The cash system for clothing has been a real blessing. I really could buy everything in sight if I let the bad boy out. Having only a certain amount of cash in an envelope each month really keeps me grounded and realizing “I don’t need all this stuff.” Thanks for commenting Kerry! Thanks for sharing your story Brian. I think you bring up a great point – about making that decision and drawing a line in the sand. The decision may even be a small one, but when it’s something you’re committed to it just doesn’t feel right to cross it and eventually, over time, it becomes a habit. In the past, I totally would’ve given in, but now, it’s generally not even a second thought. I believe many people who need to change don’t because they are overwhelmed by the seemingly big financial challenges in front of them. What’s the answer to the old question “How do you eat an elephant?”? Answer: One bite at a time. Start with the small things and watch them one by one change your life. “…fall back to bad spending habits.” That’s why even though I have a great deal more financial freedom than I did when this event took place, I still diligently work on maintaining a below income lifestyle. I really don’t want to get back into bad habits. What a great story about will power! It’s true that we make these commitments to change and then when we find ourselves in a moment of temptation our true commitment is put to the test. And it feels good when we are able to face down our demons and overcome them. Good for you resisting those shoes! How we respond to temptation says a lot about our level of commitment. The great thing is the more wise decisions we make the easier it becomes to overcome the temptation. Ha! That’s great! I remember getting sucked into a few of those ‘Buy 3 Get 1 Free’ sales on books. I was quite bummed to later find out it was only a 25% discount. But definitely, just taking that time to think about your purchase, can make a world of difference in your spending habits. I can still be a sucker for those B1G1 deals, especially at the grocery store. I’m OK with them though as long as it’s in the budget. I think that’s great! I’m glad you made the right decision. You’re right- buying both the shoes and the jeans is what you used to do, now what you do now. It’s funny Holly, since that day, I’ve never fought with myself in a store over whether or not to put a clothes item back if I didn’t have enough at that moment. It turned out to be the best $25 I never spent. There are so many times when we see a great deal but know we will go over in the budget. I see it happening not only for us but others. Some people I know like us can struggle to pass up a good deal. These days it’s not so bad as we are ahead of ourselves financially being debt free but we are still very frugal and budget conscious. Good for you… the shoes moment…. brilliant! Thanks for sharing. We are debt free as well with much more financial freedom than we used to have. But continuing the discipline and focus is still important. 1) I don’t want to lapse back into old habits and 2) there are so many more goals to accomplish, most importantly building a family legacy that could last for generations.